Guards against scratches, smears, dust and dirt, and keeps your LCD screen in perfect condition. Screen protectors provide crystal-clear visibility and do not interfere with touch-screen operation. Anti-glare function helps reducing glare for outdoor use. 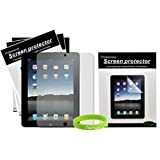 Each overlay is custom designed to fit, protect, and enhance the performance of your Apple iPad 2. Applied with a mild adhesive, each screen protector will not leave a residue on your screen and can be expected to last for as long as you wish to keep it on. CrazyOnDigital offers art design case custom fit for your ipad. With our cases it's the perfect way to personalize your device. Stylish, unique, and functional, the Crystal Candy Skin is an ultra low profile rubberized case that slips and grips onto your device. Precision constructed with anti-slip and cushioned material, the Crystal Candy Skin provides reliable protection from accidental bumps. Designed with a debossed pattern on the back, the Crystal Candy Skin accentuates and adds character to your device.